The capitulation of Bulgaria on September 29, 1918 was the first step in a series of major changes to be made in the region in the coming years. On November 4, Austria-Hungary ended its participation in the war. The event was followed by a Hungarian revolution of sorts in Budapest aimed at establishing a Hungarian state. Power was taken over by a coalition government headed by Mihaly Karoly, a moderate. On November 13, 1918, the new Hungarian state signed a new treaty with the Entente in Belgrade, whereby the Serbian army had a temporary mandate to enter Banat with the task of maintaining order and overseeing the application of the treaty’s provisions by Hungary. However, the civil administration of Banat remained under Hungarian control, with Otto Roth leading it, the same one that at the end of October had proclaimed the creation of the Banat Autonomous Republic trying to prevent the division of Banat on Wilsonian principles between Serbia and Romania. Banat was a multi-ethnic territory. Besides Romanians, the region was inhabited to a large extent by Serbs, Swabians (Catholic Germans brought to the region in the eighteenth century), Hungarians, Jews, Slovaks, Croats. The majority population was Romanian, but it was a relative majority (mainly in the central and western regions), followed by Serbians (in the eastern region). However, the region was racked by a series of political and economic problems. The political problems were represented by the three directions concerning the fate of Banat after the war. Roth’s autonomists supported the idea of a Banat Republic within Hungary or even a multi-ethnic buffer state between Hungary and Romania. The Serbian side wanted the annexation of the entire Banat to the future Yugoslav state, while a part of the Romanian political class also wanted the annexation of the entire region to Romania. Serbian claims were met by the intransigence of Ion I. C. Brătianu that was justifying the annexation of Banat up to the Tisza River, in accordance with the 1916 treaty with the Entente. From the start autonomy was ruled out, as the Entente had promised the whole region to both Serbia and Romania. At the same time, at the Paris-Versailles peace conferences there were voices supporting the Serbian cause (Serbia had not signed a separate peace with the Central Powers) while other voices supported the Romanian cause (remarkable at this time was the interventions on behalf of Romania by General Berthelot). Complicating the matter was the fact that the region as a whole formed a tight knit economic unit. The same solidarity among the four are also found in attempts by the Hungarian authorities to dismiss Svetozar Miletić as mayor of the city of Novi Sad. The establishment of a Romanian National Party in Banat and Hungary in Timișoara on February 7, 1869 took place at a conference attended by numerous Serb delegates. Concerning the war, the occupation of Serbia by the Central Powers in January 1916 was followed by the withdrawal of the Serbian army to the island of Corfu. 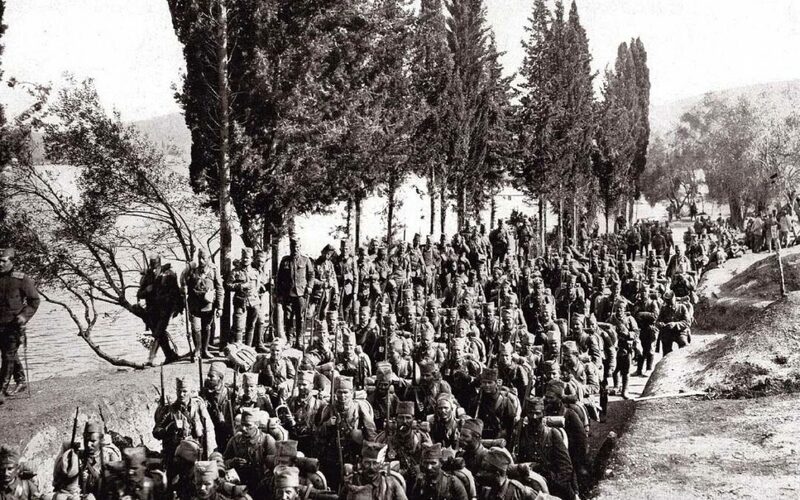 Some Serbs in the Austro-Hungarian army deserted and succeeded in joining the forces of the Entente, including a Serb division that fought against German-Bulgarian troops in Dobruja.